The flower child of the Seventies is now 47, wealthy and happily married. But Joni Mitchell is still making records, and MICK BROWN found her free spirit undimmed. THE HAIR still tumbles to the shoulders, sunshine blonde; the smile is as winsome as ever; the perfect bone-structure remains, well, perfect. The hippie threads, of course, have long since gone. 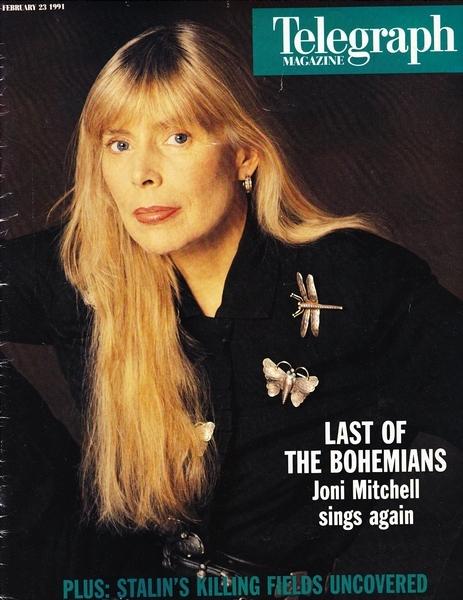 At 47, Joni Mitchell dresses expensively, all in black, her dress studded with exquisite silver jewellery. Even the cigarettes she smokes are particular. They are called American Spirit, and come in a sky blue pack, and they say a lot about Joni Mitchell. For these are truly designer cigarettes, free of artificial additives, expensive. Mitchell volunteers the long and detailed explanation of the true smoking aficionado: ordinary cigarettes contain saltpetre which makes them burn down quicker; these cigarettes last longer, but you still have all that addiction-quenching nicotine. Joni Mitchell smokes incessantly; even as the last plume of blue smoke from one cigarette is melting in the air, she is relighting another. One sees in this a small, but telling gesture of defiance. In California, smoking is regarded with the puritanical disdain of a social disease; Joni Mitchell — for many, the very personification of a certain Californian way of life (although she is actually Canadian) — doesn't care. This lends her a go-to-hell rakishness. Mitchell's early songs depicted her as a restless free spirit; men loved her for it and women envied or identified with her. She was the neophyte spirit of the age; the author of Woodstock, the song of the event; the girl who was muse to rock stars, and to whom they in turn played muse themselves. How Joni Mitchell has aged is therefore of more critical concern than might usually be the case. The news, in short, is well. The romantic tribulations charged with unabashed candour through her early albums have been stilled. The long line of suitors finally stopped at Larry Klein, a musician 13 years her junior, whom she married eight years ago. Mitchell refers to him often, not as Larry but rather as 'my husband', with a proprietorial formality which is surprising. It is a happy marriage, a happy life. She has developed a second career as a painter and is wealthy enough to maintain four homes: one in New York, a retreat in British Columbia, a beach house at Malibu, and a Spanish-style property in Beverly Hills. Some of her songs have become American institutions. Big Yellow Taxi is sung in primary schools to teach children about ecology; The Circle Game is sung at high school graduation ceremonies; and Both Sides Now has been recorded by Frank Sinatra and Bing Crosby. For someone so revealing in her songs, Mitchell guards her privacy. We met at the photographer's studio in Hollywood. Her new record, NIGHT RIDE HOME, percolated gently, recurringly, over the hi-fi. 'Fabulous,' breathed the make-up artist. The photo-session was interminable but Mitchell bore it with a stoical patience — turned it, indeed, into a team endeavour, talking knowledgeably about angles, planes of light, moods — striking poses and smoking all the while. Photography turns out to be a passion. When she is not writing or recording, she paints; when she is not painting, she takes photographs; she describes this process as 'crop rotation'. 'When I first started taking pictures,' she said, 'I liked Cartier-Bresson — that idea of pick your location, and lay there and wait for the one shot. And that's made for some beautiful days; just get in the car and drive off to some spot, and wait there for the action to occur, and suddenly two other bits of action you hadn't anticipated happen also. to me the thrill of life is when things turn out better than you thought. The mystery of surprise is probably my favourite...' she savoured the word, 'my favourite kick'. With Mr. Kratzman's words ringing in her ears, and inspired by the example of the young Bob Dylan, she took up the guitar and started writing songs and performing in local folk clubs. At this point her life took a messy turn. At 20 she gave birth to an illegitimate daughter, whom she named Kelly. Broke, struggling in her career, she put the child up for adoption. It is a subject seldom mentioned. She also made an unhappy marriage, to a folk singer named Chuck Mitchell, whom she wed after a 36-hour romance. The marriage took her from Canada to Detroit, where they worked together as a duo, Chuck and Joni; it lasted barely two years. By then Mitchell was already outstripping her husband, making a reputation for herself as a songwriter. Her work was championed by other singers, and by the time she arrived in California and recorded her first album, in 1968 (dedicated to 'Mr. Kratzman, who taught me to love words'), her reputation was already made. Mitchell settled in Laurel Canyon, an enclave of artists and singers in the hills above Los Angeles. Time has imbued this period with a certain mystique; bearded troubadours, spirited women-folk, endless sunshine — popular music's last true idyll before the rude intrusion of reality. 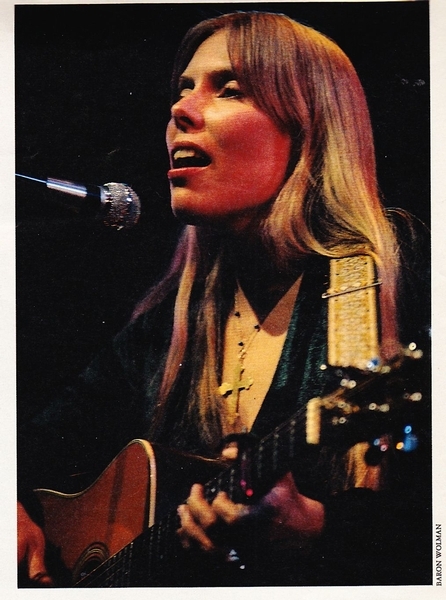 With her flaxen hair, toothy smile, and cornflower blue eyes, there was no more fragrant flower-child than Joni. Nor, in an era of confessional singer-songwriters, was there one more candid, more revealing of emotional frailties. Mitchell raised candour to a high, and sometimes dangerous, art. Rolling Stone magazine once published a family tree of her most famous liaisons: James Taylor, Warren Beatty, the singers Stephen Stills and Graham Nash, and record company entrepreneur David Geffen. It must be said that the public absorption in her life has waned somewhat. The days of platinum-selling records are long gone. Like Bob Dylan and Van Morrison, her career has transcended the short-lived incendiary flash, and settled into a more stately — if sometimes fitful — progress. And yet, her music has remained no less absorbing, for above all else Mitchell has remained true to herself, a trick that few of her contemporaries managed to pull off. Her music became steadily more ambitious, more demanding, and in the process more timeless. The songs about being young and innocent gave way to songs about middle-class, middle-aged, and the compromises, disenchantments and joys it may bring. Notably, her new record (her 16th) includes one song about alimony payments ('You'd eat your young alive/For a Jaguar in the drive') and another about nostalgia. Mitchell makes no bones about writing for an audience old enough fondly to remember being young. Perhaps the most fatuous thing ever written about her was that she was 'a flailing liberal unwilling to jump what was left of the good ship Woodstock', as if idealism were something that should be given up. Still, the accusation stings. Although she wrote Woodstock, the song that would, for a short while, become the anthem for the moment, a traffic jam prevented her from attending the even herself (a misfortune that turned out to be a prophetic metaphor for the whole shooting match). The centre-piece on her new record, Slouching Towards Bethlehem, is a measure of the distance between those times and these, a mordant invocation of apocalypse, adapted from the W. B. Yeats poem, The Second Coming — 'And what rough beast, its hour come round at last, Slouches towards Bethlehem to be born?' When I mentioned the song, she launched into a detailed and accurate account of the book of Revelations (I checked later, in the Gideon bible tucked in the top-drawer of the dresser in my hotel), and its pertinence to the Gulf war as the final judgment made manifest. Actually, her career can be seen in another way, as a sustained attempt at reconciliation: between the desire to be a free spirit and the desire for emotional security; between a naturally cheery disposition and the vagaries of the real world; between bourgeois comfort and bohemian aspirations. 'How do you retain spirituality,' she laughs, 'and still have a nice living-room...I haven't solved that one, but it doesn't pinch like it used to, I think you have to be balanced.' Thus, she considers herself 'a curator' of the large collection of American-Indian art she owns, 'because they're only in my possession for a while, and I have a responsibility for them.' And royalties from the songs Lakota (about the plight of the Indians) and Ethiopia (about famine) go to a special fund for charitable use. Mitchell is a beguiling conversationalist, one minute displaying the earnestness of the studious child, the next a playful disingenuousness. At times she has the air of spit-in-the-palm-and-slap-the-pants enthusiasm and free-spiritedness, which is one of the more endearing qualities of the American character. She told me a story which was very revealing, about how she had been walking down Hollywood Boulevard one day, looking for a costume to wear to a Halloween party, 'when all of a sudden this black kid goes by with a New York walk — you know, the diddybop, with one leg shorter than the other and the hand curled back — and as he passed by he turned and gave me this most radiant grin and said, "Lookin' good, sister, lookin' good"' — the mimicry is perfect — 'And he gave me a grin, and it was such a genuine, sweet smile; it woke up the spirit in me. 'I began walking behind him, imitating his walk; he just took me into this very fun-loving mood, and he caught me at it, and laughed. So I thought, I know...I'm going to this party not as him, but as his spirit.' Outfitted with a blue polyester suit, a phallus-shaped cocaine-spoon, an Afro wig and copious amounts of Lena Horne pancake, Joni Mitchell thus embarked on a short, but apparently riotously eventful career at parties and social functions as a black man. I liked this story. It suggested an innocent's pleasure in the moment and a spirit of untrammelled anarchy in equal measure. It is easy to believe that, in many ways, Joni Mitchell has attained the perfect life. She makes records at her leisure. She is as successful as a painter as she is a musician: an exhibition of her work over the past 10 years was recently seen in London and Scotland, and her paintings command prices most other living artists would envy. She is at peace with herself. 'I know myself pretty well. My husband and I have been together nine years, and I like him and love him. It just gets better. As for myself...you know the old thing; you work out what you can change, and hopefully lighten up and laugh at what you can't.' It was a pat response. But she said it earnestly. Then giggled, and reached for another cigarette. This article has been viewed 4,623 times since being added on October 26, 2012.